Author Mason Cross, who lives near Glasgow, tweeted a photo Thursday showing how his 11-year-old daughter, Ava, answered one of the questions on her school’s feedback form. 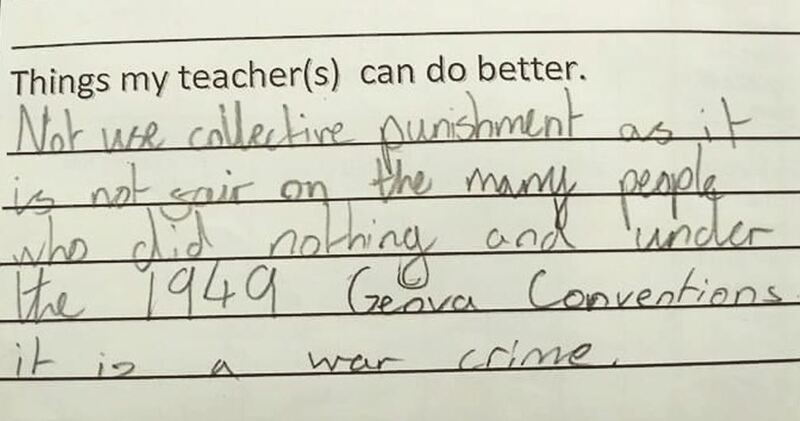 “My daughter actually submitted this feedback at school. Not sure if I should ground her or buy her ice cream,” Cross tweeted. “I should clarify that she thinks her teacher is awesome — it’s just this aspect of the educational justice system she has an issue with,” Cross wrote in a follow-up tweet.